Sam Byram, opened the scoring for Leeds United. Two goals in an eight-minute spell either side of half-time put Leeds United on the way to another win on their travels as they beat Fulham 3-0 at Craven Cottage. Sam Byram put the Whites ahead and Sol Bamba doubled the advantage before a late goal from Mirco Antenucci put the icing on the cake and lifted United into the top half of the table. But the victory owed plenty to the heroics of goalkeeper Marco Silvestri and some wasteful finishing and bad luck for Fulham who finished with 10 men. United rode their luck to be ahead at half-time after a shot count of 11-2 against them and were grateful to Silvestri as well as scorer Byram. Fielding a side with just one change from the one that battled to a draw with Nottingham Forest on Saturday - Byram back from injury to resume his right side midfield role with Steve Morison back on the bench - they were immediately put on the back foot by opponents more desperate for the points to aid their relegation fight. Six minutes in, former Leeds favourite Ross McCormack had his first sight of goal only to be denied by a fine save by Silvestri. The keeper then acrobatically kept out Bryan Ruiz’s shot and saved low down from Konstantinos Stafylidis to further frustrate the hosts. Another of Fulham’s ex-Leeds men, Matt Smith, was next to be denied by Silvestri after getting his head to a McCormack cross. Ruiz’s corner clipped the crossbar and United somehow survived again when Smith headed McCormack’s free-kick wide. Leeds finally got an effort in themselves, but it was an easy save for home keeper Marcus Bettinelli from Giuseppe Bellusci 40-yard half-volley. Fulham did get the ball in the net on the half-hour only for McCormack’s volley to be ruled out for offside. Relieved Leeds survived another couple of attempts from McCormack and Tim Hoogland before they produced a classic sucker punch five minutes before half-time. Gaetano Berardi’s cross picked out Byram and the United youngster sent his header past Bettinelli to give his side a shock interval lead. Neil Redfearn’s men sprung a further surprise within three minutes of the start of the second half as they scored again. Central defender Bamba was on target with his first goal for the club, heading home following an Alex Mowatt corner. It got worse for Fulham soon after when they were reduced to 10 men with Stafylidis sent-off for two bookable offences in quick succession, dissent then bringing down Byram. Home keeper Bettinelli kept his side in the game with a save from Mowatt’s shot from outside the box and still Fulham battled on as Michael Turner hit the post with a header. Smith was off target with a shot and another header as the hosts’ frustrations continued. 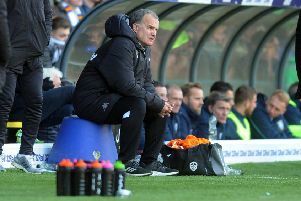 Leeds boss Redfearn put on Morison for Sharp up front and the substitute soon threatened only to be denied by an interception as he looked to get on the end of Byram’s cross. But the action was back at the other end as Smith was denied by Silvestri and McCormack headed wide before hobbling off. To emphasise that this was not Fulham’s night United put on Mirco Antenucci for Mowatt and the Italian came up with his first goal since early December, netting from the rebound after Bettinelli had pushed out Byram’s cross. Fulham: Bettinelli, Richards, Hutchinson, Turner, Stafylidis, Hoogland, Parker, Tunnicliffe, Ruiz (Kacaniklic 63), McCormack (Fofana 83), Smith. Leeds: Silvestri, Wootton, Bellusci, Bamba, Berardi, Byram, Cook, Murphy, Mowatt (Antenucci 82), C Taylor, Sharp (Morison 67).